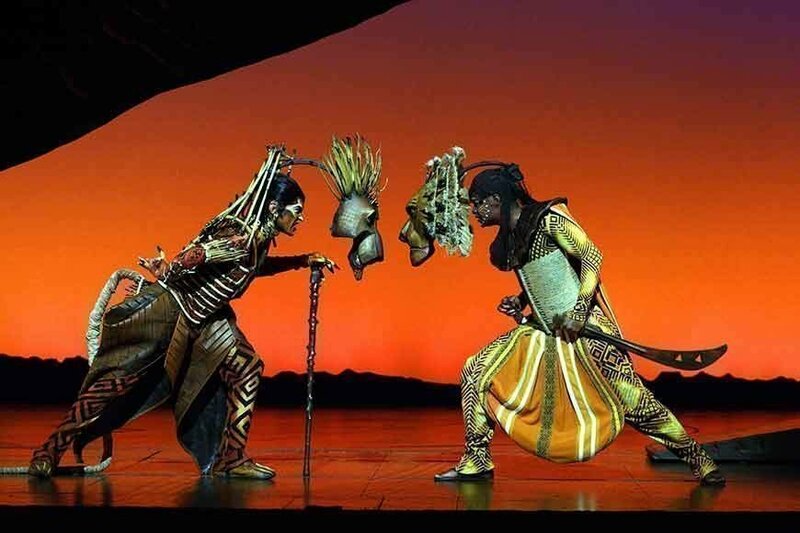 The Lion King, a roaring stage success! 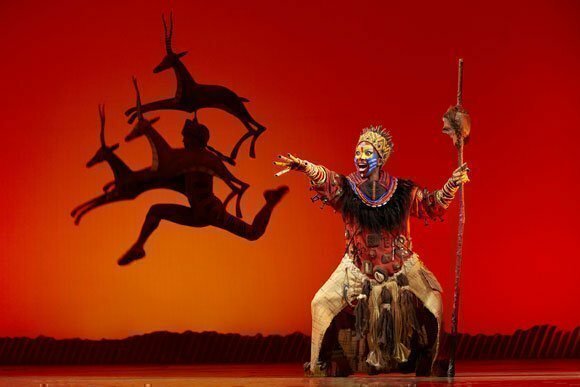 Transport yourself and your children to the magical world of the African bush, where life-size animals roam the stage and a magical tale of triumph against evil unfolds. 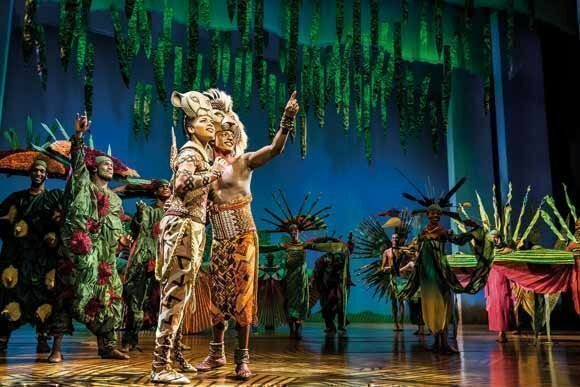 With six coveted Tony Awards, a Grammy award for the show album and two prestigious Olivier awards under its belt, this is a real show stopper of a musical for the whole family. Join little Simba, the next king of the Pride, in his fight to take his rightful place on the throne. 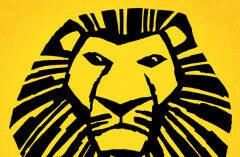 Simba the lion cub is looking forward to becoming the king of the Pride. But his wicked Uncle Scar scuppers his plans and when tragedy strikes, Simba runs away, leaving Uncle Scar and the nasty hyenas in charge. Under their mis-management, the Pride Lands soon become barren and everyone who lives there is in big trouble. Can Simba and his good friends Timon and Pumbaa solve the problem, and can he restore the essential Circle of Life? The Lion King the movie was absolutely fantastic. 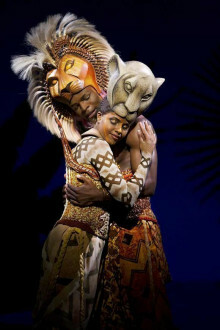 But good as it is, it doesn’t prepare you for the sheer magic of this superb stage production. 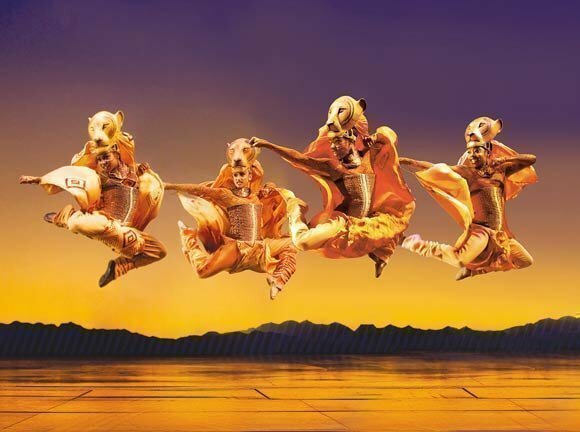 The Lion King features a host of amazing creatures in fantastic costumes, superb choreography and an intimate stage experience you never get with 2d film. Elton John’s runaway best-selling musical score, together with Tim Rice’s unforgettable lyrics, makes this show really special. Elton’s song Circle of Life sets the stage, giving a powerful introduction to this delightful tale about coming of age that’s just as relevant to humans as it is to the creatures the show portrays. 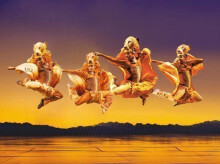 A roaring success of a musical, attracting full-house audiences since opening in 1997, it’s a tour de force in professional puppetry, delivering a genuine spectacle that’s very hard to forget. Eighteen foot high giraffes canter along the aisles, amazingly real-looking gazelles trot by, and a herd of wildebeest stampede just a few feet away. 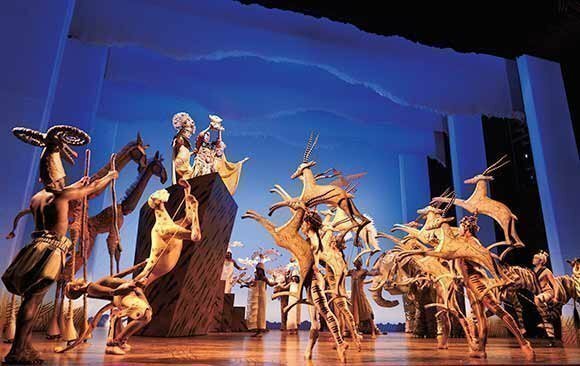 Never mind the children… adults who see The Lion King are equally astonished by the sheer skill and realism of the musical’s animal puppet stars. Apparently it took an enormous seventeen thousand hours to make the puppets and masks. A hundred and fourteen people are involved in creating each showing. 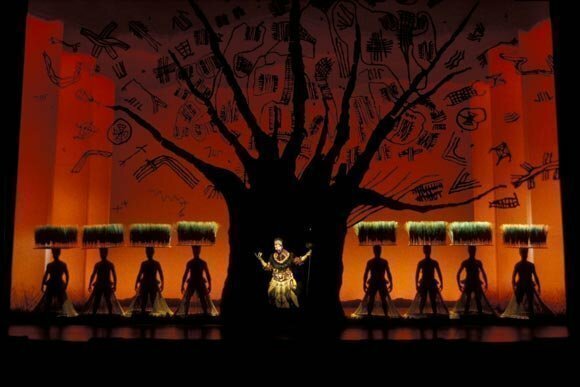 And more than fifty million of us, from all over the world, have enjoyed The Lion King on stage so far. 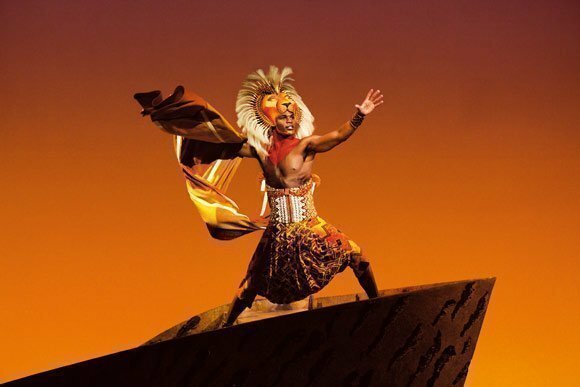 Expect to sing along to twenty fabulous show tunes including, in act one, Nants' Ingonyama/Circle of Life, the Grasslands Chant, The Morning Report, The Lioness Hunt, I Just Can't Wait to Be King and six more absolute classics. Act two kicks off with One by One before telling the spellbinding tale of Simba through The Madness of King Scar, Shadowland, Endless Nights, The Lion Sleeps Tonight, the all-time favourite tune Can You Feel the Love Tonight and more, finishing off with a rousing performance of King of Pride Rock/Circle of Life. 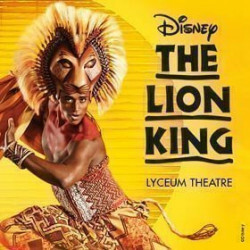 We provide great seat and ticket availability with a wide choice of seat options, premium and full price tickets as well as discount The Lion King tickets, covering the full range of prices to suit every budget. Bear in mind the show contains strobe lighting. Well done.! Sets out if this world! If ny 17tr old could still love it you guys rock. Lovely classical theatre. Creative costumes and scenery. It was impressive how the versatile scene was creatively changed to arouse different sentiments. However, it was too hot, at least where we were seated so don’t forget to bring water with you. Toilets were nice and clean. Very entertaining. A must see experience! Have seen this show a few times now and this time didn’t disappoint. We took children with us this time and they loved it too! Very well told , a must see . But bring your hanky. Le meilleur spectacle que je n'ai jamais vu. Un spectacle magnifique! Ce moment restera gravé dans mon esprit. Un des plus beaux spectacle de ma vie si ce n'est le meilleur. On en prend plein les yeux les oreilles ! Acting est extra les costumes tout simplement sublime. Enfin un cocktail juste explosif de bonheur. Lots of laughs brilliantly done. Wanted to see the show when it was in Australia. Had the pleasure of seeing it at the Lyceum. Would recommend this show to anyone who loves a brilliantly entertaining show. I had heard many good reviews and had always wanted to see and it didn't disapoint. what did you do to the Lion King? 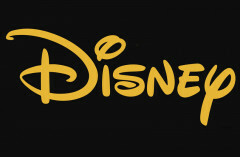 It’s not really for kids even though it’s the lion king ? It was good but I was a little bored . An unforgettable experience.such vivid costumes,creative scenery,and artistic athleticism.oh,and comedy too! What a fantastic family show. Everything about it exceeded our expectations. The cast were amazing. Costumes stunning. 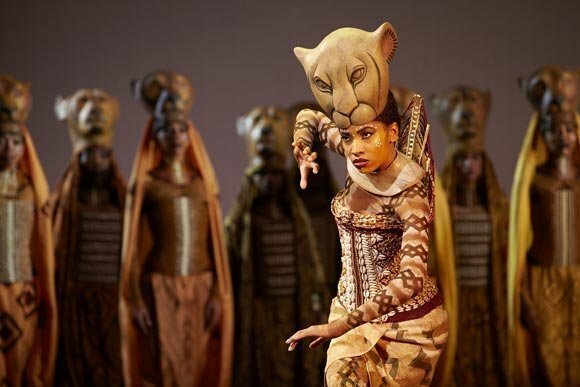 I Love Musicals and it was overdue for me to see The Lion King! The performance was flawless. Though I had the feeling that some of the other theatre goers were more in a „Cinema“ Mode for the show- chatting during the performane, leaving all kind of trash behind. A wonderfull show.Although there was a lot off noice of little children and teenagersand disturbed the show.Mayby the days can be separeted wth or without children. But again ,the show was fabulous!!! Creative and a must see! A must see for all, we took my 79 year old mother, she was amazed at the skill of the performers. Truly spectacular, would see again. Truly brought me to tears. Africa Comes Alive In London! Really great show! So well done! Entertaining! Value for money! Why are you still sitting there ... book a ticket! A must see, if only for the costumes. From the very start we were saying “wow” to the imaginative costume design. The music & singing couldn’t be faulted. Great show for anyone to enjoy. I had seen it before but took my 20 year old grandson this time, he rated it as highly as I did. An excellente show. With Really good actors. The costumes and scene was Awesome. Love this show, was absolutely brilliant, I laughed, cried, can't really say much more, I would definitely see it again. Has the best night. Thank you. Did not understand the wording. It was a superb show. Great entertainment. Absoloutely magical, awesome, fantastic...worth the price, everything about the show was mind blowing. I felt I was in Africa. Excellent!! My son thought is was brilliant. He is 5 years old and sat through the whole show- kept him captivated. The use of lighting, the use of space around the theatre was so magical.....i am totally speechless!! Amazing show! A must see!! Super show. Everybody has to See. Not the first time been to the show, but guess what I would also come again. Love it to bits as myself and my fiancé had an AMAZING time. Such a brilliant show. Went for Valentine’s Day and was not disappointed at all. Absolutely brilliant the stage was amazing the costumes and music was first class. Had such a great time and would recommend this show to anyone of all ages. We chose row G Stalls and had the best view and right up close. Perfect. Show was promptly on time no waiting to get started. Thank you Lyceum. The singing was a bit weak, and especially the children not much better than your average school play. Fun costumes and snappy dialogue but not really engaging story or acting. It was good for children! Loved it! This was a Bucket list item, so we paid for good seats. Woth it! I took my 78 year old parents. The show was visual and creative. We sat on the main floor in row L. We could see everything and loved it when the animal came down the isle. This show is timeless. Lots of people said it's a great show. We were very disappointed. Colourful, creative, with beautiful music! My fiance and I were riveted. Quite steep seating I struggle with heights! 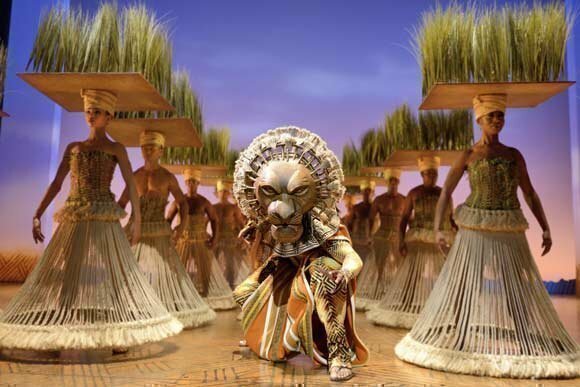 The costumes are unbelievable but pair this with amazing acting and you have yourself one amazing show! It was nice to watch, but not the best musical if you are not a kid. Of you have kids, they'd love it. Best thing I have ever seen!!! Made my girlfriend cry! Must see! So phenomenal! Inspiring! 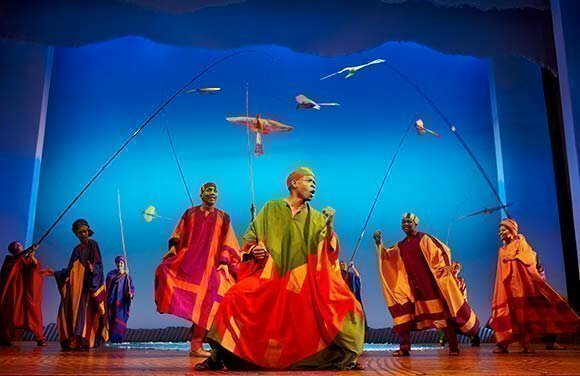 An ingenious production, which mesmerized the audience throughout. Incredible performance and thoroughly entertaining. The costumes were very impressive. A great family show but perhaps not ideal for a very young audience. Perfect start of a London weekend! Fantastic show amazing costumes cast where excellent, but for the price you could get better seats in an equally good show, ideal for children and families but Wicked is also a good option. 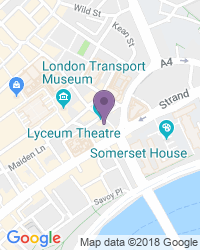 Use the search box at the top left of this page to search for The Lion King tickets availability.